KleerKut are now one of the leading Invasive Weeds Specialists in central Scotland. Our experience and knowledge has resulted in KleerKut becoming Approved Consultants and Contractors with many of Scotland’s leading developers, consultants and contractors. We are an Invasive Weeds Specialist with a proven track record of successful eradication and management of all types of invasive weeds throughout the construction, commercial and domestic market places. KleerKut believe that good management is the key to low cost and fast control of invasive weeds. We employ best working practices on site to ensure that the job is done right first time. Ensure that before works start on site that there are no invasive weeds on site KleerKut recommend using an experienced company to survey your sites. One of the main reasons to use an experienced Japanese Knotweed Specialist can be demonstrated by the irresponsible use of herbicides being regularly proposed in the treatment programmes that we review. We often see instances of overdosing, incorrect dose rates and unsafe practice being proposed and presumably carried out. Having successfully dealt with Japanese Knotweed for over 7 years we know that by using the wrong herbicides, or even using the right herbicides in the wrong way, can result in unsuccessful eradication of this very difficult to treat plant. Herbicides can be used in gardens safely, on occasions spraying is not suitable and in these situations alternative methods such as weed wipes or stem injection can be employed to safeguard children and pets. 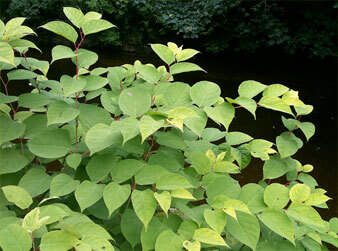 KleerKut ensure that treatment of Japanese Knotweed and all other invasive weeds has minimal impact on the environment. We employ best practicable environmental options. KleerKut have developed from a construction background which means that we understand development. Our solutions are practical, transparent and safe and engineered in-house. This is paramount and a key consideration at both the design and construction stage. The Property Care Association are a recognised trade association who are setting the standards in the invasive weeds industry. The PCA carry out rigorous vetting which allows them to offer Trustmark accreditation to all members. KleerKut are accredited members of the Property Care Association. We don’t close the file once the job is complete we will check the sites regularly through our guarantee period to ensure your peace of mind.